Our secrets to success at Rainbow Steps are simple: we offer a wide variety of proven, time-tested classroom activities that are geared toward preparation for education in higher grades, and throughout life. 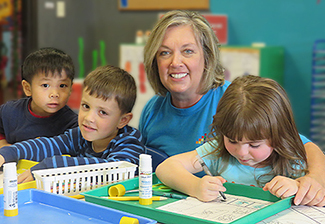 We make your child's transition from home to school in a supportive, creative, caring manner. All through the school year, we have fun, but we always concentrate on students' basic abilities needed for a good education. 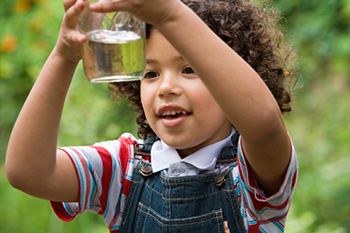 Children acquire skills faster by hands-on experiences. 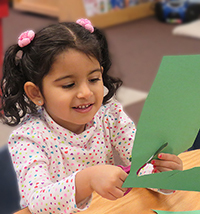 In order to develop, we encourage students to touch, observe and explore so that they develop beginning skills in math, art, language, science and music. Lots of our games and other activities are designed to assist students at gaining control over their large and small muscle groups. Fine motor skills are small movements, such as grabbing with thumb and forefinger, that use the small muscles of the fingers, toes, wrists, lips, and tongue. 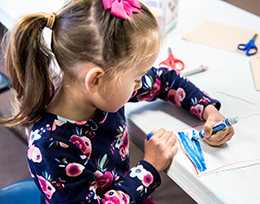 In many Rainbow Steps activities, like cutting, pasting, coloring, puzzle assembly, and bead stringing, your child is building muscles in her fingers that will give her better control when she begins writing. At home, you can encourage fine motor skill development through play with Lego pieces, Lincoln Logs, and other similar activities that use the pincer grip, such as tongs, tweezers, eye droppers, and knobbed puzzles. 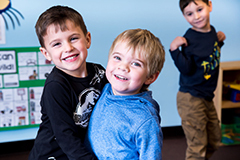 Part of the Rainbow Steps experience for your child is developing socialization skills. 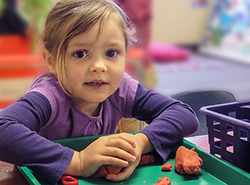 At preschool, a big part of learning is to get along with other children, to follow a school routine, to wait one’s turn, to use words instead of hitting, and to share. Living within a community setting is important throughout life, so we provide group-oriented activities that teach children to cooperate and collaborate, to negotiate with others in order to develop a respect for others, and to develop an understanding of working together. There is no replacement for, and no greater lifelong social advantage than, a classroom of your child's peers. Our classrooms are carefully thought out to provide a feeling of organization, so that students can feel some inner security, learn more about self-discipline, and learn some sense of order in their school life. While there are lots of things to explore, enjoy and learn, the routine of putting everything in its place at the end of each school session is aimed at promoting security and self-discipline. One of the prerequisites for creative learning is the fostering of curiosity. Many of our activities are designed to offer up a variety of opportunities, materials and activities to your young student, so that her natural desire to know about her world will widen into curiosity. Learning comes about, in great part, through the ability to listen and follow instructions. Throughout life, success is more likely if students have formed positive listening skills, have learned attention to detail, and have the ability to concentrate. Many of our art projects, reading sessions, and music activities are aimed at promoting listening and concentration. When we encourage physical exercise in the classroom or on the playground, we are working on developing gross motor skills, which are the bigger movements--such as running and jumping--that use the large muscles in the arms, legs, torso, and feet. Improved hand-eye coordination is generally a result of gross motor skill activities. Tour our school to see the best.